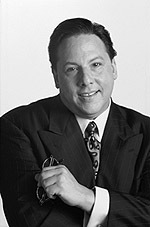 Reed Trencher started a public relations firm in San Francisco in July of 1974. By 1980, San Francisco Magazine, in its June issue, had dubbed him "publicist extraordinaire." Often hailed as one of the brightest, most original thinkers in business today, Trencher is widely-known throughout the media and communications industry for having instituted "Pay-for-Performance" in his own field. Numerous articles on his controversial approach to publicity have appeared in such national media as Columbia Journalism Review, INC., Marketer, and Continental Profiles. In its April 20, 1987 issue, Newsweek, devoted a full-page story solely to Trencher's novel idea. In 1979, Trencher concluded that only unsolicited person-to-person 'word-of-mouth' endorsements influence people more than news media attention. "Aside from that, media exposure is the gold standard of credibility to the vast majority of for-profit companies. It's what usually helps companies the most. A great P.R. firm knows this and can 'deliver' it." he said. Soon after, Trencher came up with the industry's first unit-pricing list by which a P.R. firm could be remunerated for its achievement, placement by placement, of media exposure for a client. The list took into account 400 American media outlets. Coupling this innovation with a belief that it is distinguished former-journalists who can best act as media placement specialists, Trencher established Primetime Publicity and Media Consulting in l98l, on the exciting premise that clients would pay for publicity only after his firm had placed it. That he continues to pace the field of public relations is further evidenced in 2004, by his having embedded his 'accountability' approach into a variety of reputation management services never before offered by any other firm. The effectiveness of each of them is predicated on journalistic acumen. The real winners, of course, are many of the companies, new and mature, large and small, that become Primetime clients. Many have seen that fair, balanced media coverage in magazines, newspapers and on prestigious broadcast programs -- particularly in this era of radically shifting mass-access to information -- is cost-effective and, most of all, of utmost strategic value. Trencher's message of principled agency/client responsibility reaches across the service industry to both sides of the checkbook, as customers, managers and stockholders echo the call for real accountability to permeate all areas of commercial enterprise.